If the dog had Superman’s powers it would be just awful. Every day we’d pull into our driveways wanting nothing more than to take off our shoes, warm up our leftover fried chicken, and watch bass fishing show marathons, but lo and behold there would be yet another pile of mailman ashes smoldering just outside the front door. Once inside there would be old Rover himself, powerful enough to destroy an entire solar system with a sneeze (Superman actually once did this), and you’d beg him not to jump on you. Too late -- old Rover just knocked you into orbit. The poor cat looks on in horror as you turn into a speck on the horizon. But maybe the dog could use the Man of Steel’s powers for good. He’d probably be fast enough to catch 50 treats at once. If you had a squirrel problem before that’d become a distant memory pretty quick. And heaven forbid someone should break in while you’re away or knock on your door during dinner. Word would go out that your house is off limits. While your pup may not have super powers, we know they’re a hero in your heart. So spoil them by letting them do every dog’s favorite thing: wearing clothes. 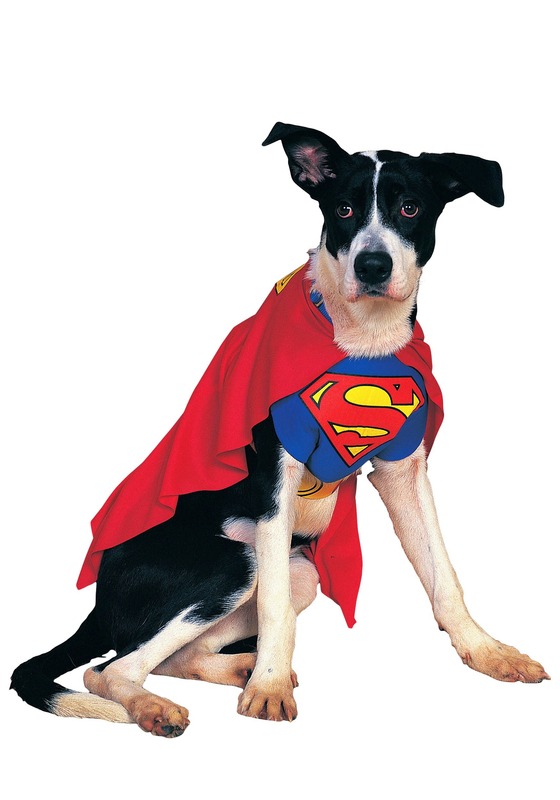 Our Superman Dog Costume has a fluttering red cape, Superman’s iconic “S” logo on the front and back, and fits securely so it won’t get all bunched up and weird-looking. Up, up and away, Bowser!